of you have any idea what I'm talking about?" It's getting close to holidays, but Alexander Ovechkin and Bruce Boudreau may have crossed each other off their shopping lists based on an incident that took place earlier this week. After Boudreau decided to bench him during a crucial shift late in the game, Ovechkin appeared to react to the news by barking some well-chosen obscenities in the coach's direction. While the two later made an effort to seem like they were on the same page, that didn't stop fans and the media from speculating about a rift that could divide one of the league's best teams. An overreaction? Probably. But whether Ovechkin and Boudreau are feuding or not shouldn't even matter, because this sort of thing actually happens all the time. 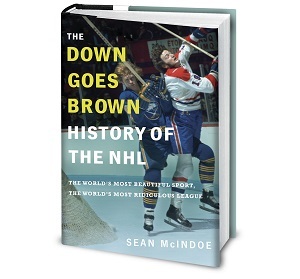 The NHL has a long history of disagreements between superstar players and their coaches, and many of them were far more serious than a few expletives uttered in the heat of the moment. Here's a look back at some of the notable star vs. coach feuds in NHL history. November 18, 2003 - An enraged Scott Stevens accuses Devils' coach Pat Burns of not being a first ballot Hall of Famer, before later apologizing and admitting that could only happen in a world where the selection committee was made up entirely of idiots. October 26, 2011 - Alain Vigneault's attempt to fire up his best goaltender during a private meeting in his office is ruined by Roberto Luongo constantly knocking on the door and asking "Hey guys, what are you two talking about in there?" February 4, 1978 - Bruins' defenceman Brad Park finds himself in the doghouse after coach Don Cherry realizes his name is completely impossible to mispronounce. December 7, 2008 - Team captain Daniel Alfredsson request a one-hour meeting with the head coach to discuss his declining ice-time, but eventually gets tired of having to start over again every fifteen minutes whenever Bryan Murray hires someone new. February 27, 2001 - Martin St. Louis is momentarily confused by the sight of a red-faced John Tortorella gesturing furiously while screaming obscenities at him, before veteran teammates reassure him that that's just how the coach says good morning. January 30, 1996 - Blues' coach Mike Keenan tersely informs Brett Hull that he's never going to win anything if he keeps scoring goals with his foot in the crease and hoping the referees will just magically forget about a rule that's been in the books for years. October 12, 2011 - Paul Maurice tries to diffuse some tension with Eric Staal by joking that at least this year's Hurricanes aren't as inept as those hopeless losers he was stuck with in Toronto a few years ago, before wondering why half the dressing room is just staring at him sadly instead of laughing. April 5, 1986 - A concerned Mark Messier tells Oilers' coach Glen Sather that while he agrees the team's unquestioned dominance does result in them occasionally becoming complacent, he's still not sold on this whole "let's occasionally score into our own net just to make it more challenging" plan. March 3, 2006 - A confused Mike Babcock begins to wonder why Brendan Shanahan won't accept anything he says unless it's accompanied by an awkward video-taped explanation. January 14, 2009 - After an obscenity-filled exchange ends with head coach Wayne Gretzky suggesting he go meet with the new assistant, Shane Doan thinks about how much he appreciates being able to air his grievances and makes a mental note to apologize for his harsh tone and briefly wonders why the new assistant coach looks so much like Dave Semenko holding a crowbar. November 2, 2011 - Jets' coach Claude Noel spends hours attempting to chew out his star player before sheepishly realizing that he doesn't have one. January 28, 1994 - After Pavel Bure complains yet again about a lack of chemistry with center Cliff Ronning, a frustrated Pat Quinn vows that if he ever coaches another European franchise player he just won't ever bother giving him any good linemates at all. "March 3, 2006 - A confused Mike Babcock begins to wonder why Brendan Shanahan won't accept anything he says unless it's accompanied by an awkward video-taped explanation." So while I'm probably not the first to notice this, as a Bruins fan I'd like to say that I'm sad to see the Toronto-themed tagline replaced with simply "hockey humor." While I suppose this is correct given how the blog has flowed from Maple-Leafs themed posts to more general NHL ones, it was still nice to be able to cheer up Leafs fans about something. Craig Janney never played for the Canucks - his rights were traded to Vancouver but then back to St Louis. Dammit. I've been getting Craig Janney confused with Cliff Ronning for almost 20 years. It finally caught up with me. As a Hurricanes fan (yes, there are a bunch of us), maybe that explains why our team is stinking it up? 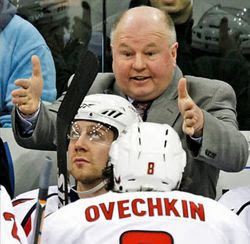 BTW, you realize that there is something wrong with your caption - there are no F-bombs in it - so it really can't be coming from the mouth of Boudreau. Interesting article about Bruce - he owes a debt of gratitude to the Leafs for playing him long enough to get his pension. "Pat Quinn vows that if he ever coaches another European franchise player he just won't ever bother giving him any good linemates at all." Speaking on behalf of all Coyote fans, I must say that we were both appalled by anit-Doan diatribe. Though I guess you have Kessel for that now. *sips from new cup*"
Ah yes the obligatory Kessel joke from a Bruins "fan". What you fail to realise is that a) Boston winning the cup had nothing to do with the Kessel trade b) no one is interested in something you didn't do and c) Kessel is the leading scorer in the NHL. When did DGB get his American citizenship? Hockey HumoUr, man. You forgot the U! Ouch! As a Grant Fuhr fan that one hurts! Well done though. Caption should have read: My breakfast sandwich, with 6 types of cured meat, covered in gravy... about this long...No one has seen it??? Hmm, maybe I already finished it". You know we all peed in it, don't you? We knew we weren't getting it back. why is it that every time I see Boudreau or even worse, Claude Julien, I hear someone yelling WoobWoobWoobWoob!!! To Anon@11:47, like what? 47 years or so...? To Anon@9:37 - except for, you know, all those clutch goals Seguins scored IN THE PLAYOFFS. i have no problem with a dave semenko/violence/intimidation reference connected to wayne whenever necessary. this one was platinum!